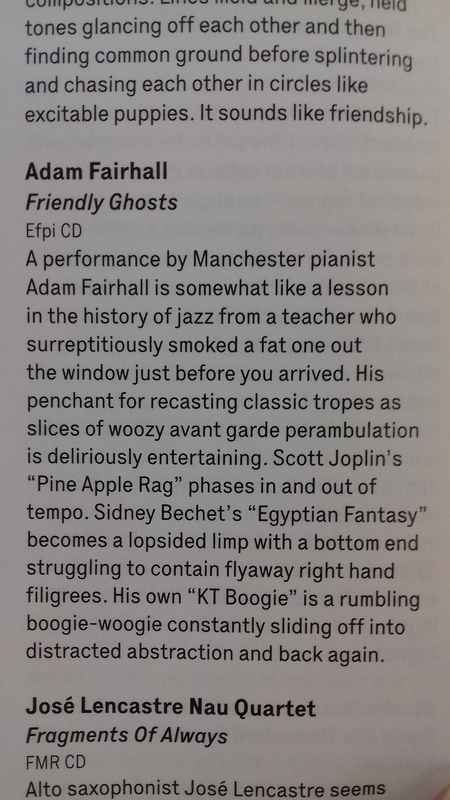 Here are five great reviews of my solo album Friendly Ghosts, released last year (2017). Please click on the reviews to enlarge. As if to insert an interlude in the proceedings, there’s the unequivocally contemporary improvisation of “Restaurant Music” whilst the lengthy “New Great Northern Stomp,” opening in free territory, explores all possible stylistic avenues before its Terry Riley-esque percussive close. With his staccato-esque piano style Fairhall comes over as a mix of Thelonius Monk, Howard Riley and Cecil Taylor with some Meade Lux Lewis, Art Tatum and Erroll Garner thrown in for good measure. Adam Fairhall’s first solo recording goes reveals his talent for bringing together jazz of the past and present, and focusing it through the lens of his own singular perspective. On his excellent 2012 release The Imaginary Delta, the pianist created a convergence of jazz’s stages of evolution, where a rag or blues nestled comfortably alongside electronic effects and modern conventions that eschew swing and bop. But that album was made with an ensemble cast, which made it difficult to determine where the composer’s vision left off and that of the collaborators picked up. 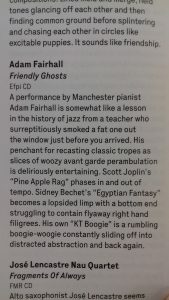 But Friendly Ghosts is Fairhall all by his lonesome, and the same confluence of jazz expressionism that marked his last session comes shining through. Nostalgic echoes of rag and stride come through strong on tracks like “KT Boogie” and “Pine Apple Rag,” while tracks like “Egyptian Fantasy” serve as a tour guide to jazz lineage. It’s one of the more intriguing solo recordings to be released in 2017. The album received airplay on BBC Radio 3’s Late Junction, Daniel Spicer’s radio show The Mystery Lesson and multiple plays on Jazz FM. It also received a mention in the Best of 2017 round-up on Portuguese site Jazz.pt (in Jose Dias’s ‘best international discs’ list).